I think my three-year-old son Lucas summarized it best when he said, so simply: "It was a beautiful, sunny day." As I sat at a table marked "Celebrating Our Families," anxiously awaiting the arrival of the first guests that Friday afternoon in July, someone approached, asking where my family members would be coming from. The 40 guests were gathering in Kansas City from all across the United States including Washington, Illinois, Indiana, Wisconsin, New Jersey, Florida, Kansas, Missouri and New York. Actually, our reunion wasn't really a family reunion in the traditional sense of the word, although without a doubt, we all felt a bond that truly could be defined as family. Few of us had ever met in person though we had supported each other, sharing a roller-coaster ride of emotions during our separate journeys to adopt children from Azerbaijan. Now we were coming together to observe a new tradition - an annual reunion of Azerbaijan adoptee families - to rejoice in the formation of our families, to honor the Azerbaijani culture, and to celebrate a love for our children that transcends all geographical borders. 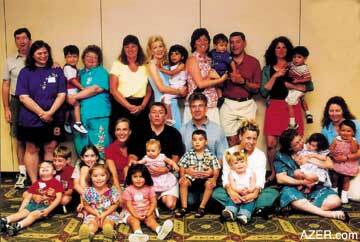 Left: The Second Annual Reunion - "Celebrating Our Families" - which took place July 2003 in Kansas City for families who had adopted children from Azerbaijan. In hosting this Second Annual "Celebrating Our Families" Reunion, my husband Jim, along with our Kansas City neighbor Judy Shifrin, and I wanted to continue the tradition that had begun with Kimi Abernathy's initial efforts to organize the First Family Reunion in Nashville, Tennessee, in July 2002. Kimi had had the foresight in 2001 to organize the Internet Yahoo ListServ (an online support group called "AzerbaijanAdopt") so that families who were in the process of actually adopting children, or exploring the possibility of doing so, could draw upon the advice and support of those who had already succeeded with it. In May 2000, the Abernathys had been the first family in the United States ever to adopt a child from Azerbaijan [See "A Home for Inara: At Last - Azerbaijan's First Adoption," Search at AZER.com]. Approximately 100 families have since adopted children from Azerbaijan. Below: Children's artworks of the Silent Artwork Auction held by Azerbaijan adoptee families. As the parents and kids began trickling in to the Sheraton on the afternoon of July 11, it became clear that the theme, "Celebrating Our Families," was the right choice for our reunion. Rather than the awkward silences that strangers usually experience when suddenly thrust together, the room was immediately filled with animated conversations and the laughter of children playing. The kids seemed to bond instantly. Though most of the children are still younger than four years old, they instinctively seemed to know that they shared a similar history. Throughout the evening, families swapped stories and hugged one another's kids, while enjoying the calm soothing sounds of harpist Michael O'Shiver. The children were mesmerized by his music. My own daughter, Rachel, particularly enjoyed the melodious "Tura Lura Lura" and quietly sang, "Tura Lura Lura. It's an 'eyelash' lullaby." She has yet to discover that her favorite song is actually an "Irish" lullaby. Returning home that night, I felt that I had spent a pleasant, comfortable evening with dear friends that I had known for a long time. Below: Judy Shifrin with her daughter Sabina and the art painted by Azerbaijani children that they selected at the Silent Auction. The main event of the weekend took place on Saturday, July 12 with a program celebrating Azerbaijani history, art, music and food. Missouri resident and environmentalist Stan Slaughter took us on a tour of Azerbaijan with a narrated slide presentation. As the families toured Azerbaijan through Slaughter's photos, we became acquainted with the people, places and traditions of the Land of Fire. Slaughter had recently spent a month in Azerbaijan as a member of the Heartland All Species Project, offering an innovative program about environmental awareness through music and other educational materials. He had worked with the Azeri chapter of Ekosfera and studied projects related to the Caspian Sea. 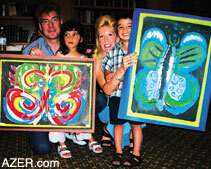 Above: (left) The Shryock Family, Jim and Kathleen with their children Rachel and Lucas, with the butterflies that the children chose for their rooms. The red butterfly is by Esmira Akchurina, 12, and green one by Teymur Mammadov, 12. Right: Miranda McDevitt, 10, and her brother Eamon, 8, were so impressed with two of the paintings by Azerbaijani child artists that they kept returning to the Silent Auction Table to make sure that nobody had outbid them for the works they wanted. 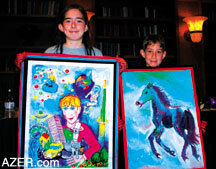 Alexander Dinets, 13, painted the boy and Musa Musayev, 14, painted the horse. 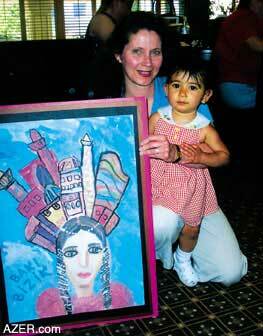 Left: Sharon Hamilton, with her daughter Hannah, who chose the artistic work of Sabina Rashtiyeva, 8. "The country has such a long history," Slaughter noted. "To have succeeded in maintaining cultural and ethnic identity despite the centuries of invaders that have marauded their land is a great tribute to their strength." Slaughter believes that close - knit families and strong traditions including yearly festivals are part of Azerbaijan's strength and proud heritage. Before inviting the children and adults to join in a sing-along, Slaughter played an audiotape of Azerbaijani children singing one of their own songs. The sweet bright melody reminded us that although the words were unfamiliar, the voices of children are capable of transcending all language. Another highlight of this year's reunion was a Silent Auction of children's artwork from Azerbaijan. Fifteen works of art had been selected and brought from Baku by Azerbaijan International's Editor Betty Blair in cooperation with three children's art instructors - Katana Sharifova, Inna Kostina and Galina Nikolayevna. Listserv member Jane Bottner had matted and prepared the works for display. Families were amazed at the vibrancy and depth of the work by children aged seven to 14. The brilliant colors attracted both children and parents. Miranda McDevitt, 10, and her brother Eamon, 8, were so impressed with two of the works that they kept returning to the auction table to keep an eye out on their favorites and up the bids when necessary. The art gave our children a chance to see Baku through the eyes of another Azerbaijani child. 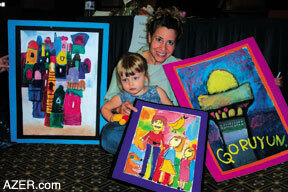 Many families expressed hope that the art auction would become an annual tradition at the reunion. They look forward to connecting with the young Azerbaijani artists via e-mail. 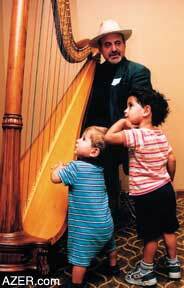 Left: Harpist Michael O'Shiver captivates some of the children during dinner the first evening of the reunion. The proceeds of the Children's Art Silent Auction - nearly $500 - have been donated to United Aid for Azerbaijan (UAFA) in Baku. Founded by Gwen Burchell from the U.K. in 1998, UAFA's main goals are to reduce the number of children in state institutions and to raise the level of institutional care. The AzerbaijanAdopt families had chosen UAFA specifically because they wanted to do something for children still living in institution care. UAFA works with four children's institutions to provide caretakers with additional skills that can assist children, some with developmental delays, in reaching their full potential. Methods of rehabilitation, such as occupational therapy, are used to help the children develop independent living skills. Our 2003 reunion has come and gone. After months of preparation, the special event is over, and the dust is beginning to settle. It's back to the daily routine for my family with a few marvelous exceptions. Through the wonder of imagination and memory, my children - Rachel and Lucas-are still playing with their new friends. I overhear references to Ben who blows the most amazing bubbles, to good friend Sabina who is fun to chase, to Hannah whose smile lights up the room, and to beautiful baby Katy whose missing hair barrette has been retrieved and, with her permission, placed on my daughter's favorite doll. As time passes, my husband and I will continue to share special moments with our two wonderful children. We will initiate our own traditions that will further bond us as a family. But, the Reunion has given us a gift, by creating a link to our children's past and by instilling in them a quiet confidence that they share a proud heritage with other special friends. Discussion has already begun about where to hold the Third Annual "Celebrating our Families" Reunion. So far, New York, New Jersey and California have been proposed as possible reunion sites. Our hope is to accommodate the wishes of as many families as possible whose homes have been made more joyful with the arrival of their children from Azerbaijan. Those interested in learning more about the adoption process in Azerbaijan are invited to join the AZERBAIJANADOPT Listserv at YAHOO.com. It's possible to read nearly two years of previous discussions and concerns, dating back to 2001. Currently, the group has 350 members. More than 4,000 messages have been exchanged. Kathleen Shryock and her husband Jim along with Judy Shifrin hosted the Second Annual "Celebrating Our Families" Reunion in Kansas City, Missouri, this past July. They are parents to Rachel and Lucas. Judy who is mom to Sabina provided all reunion photos for this article.